Evangelical Bible have announced a sale on their NKJV Single Column Bible that I reviewed last year. As you can perhaps gather from the pictures, this is the most elegant single-column edition of the New King James Version ever produced. More photos are available on the Evangelical Bible Facebook page. The Schuyler NKJV Single Column Bible, shown in Mahogany with four gold ribbon markers. Notice the excellent layout of the single-column text. This beautiful Bible is based on Schuyler's modification of a Thomas Nelson single-column typesetting (which I also photographed in my earlier review). Schuyler increased the 9-point type found in the Nelson edition to a much more readable 10.5 points, making this Bible not only more elegant but more legible. As of now, Evangelical Bible currently have the black and mahogany (chocolate) in stock. These are natural grain goatskin Bibles, both durable and a delight to hold in your hand. 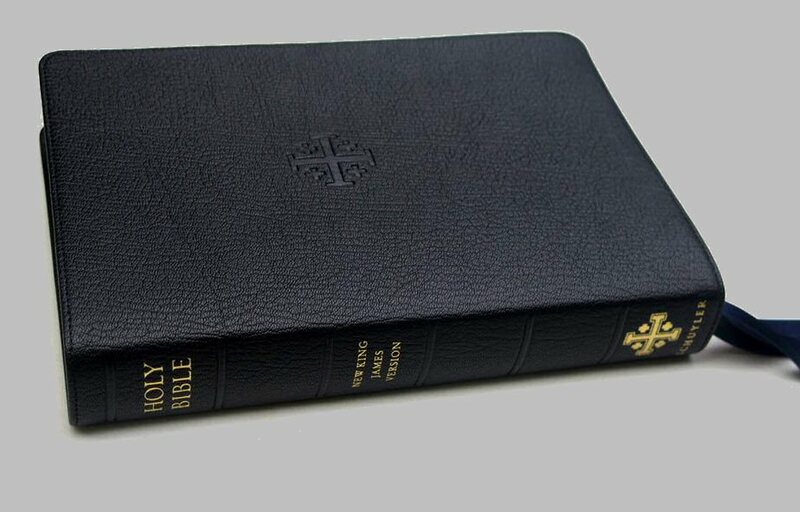 The Schuyler NKJV Single Column Bible in Black goatskin. Although you can't tell from this picture, the four ribbon markers are in a beautiful shade of deep blue. The folks at Schuyler are saying they are "now at the end of the production" of this Bible. With the introduction of the Schuyler Quentel NKJV (a two-column reference edition that I hope to review at some point), we probably won't see this single column edition again. So take advantage of Evangelical Bible's sale and get one while you still can.